Torrey House Press, 9781937226596, 240pp. "Graham's intriguing third National Park Mystery takes archaeologist Chuck Bender to the Thorofare region of Yellowstone...The threatening behavior of the park's predators is worrisome enough, and the discovery of a murdered researcher lifts threats to a whole new level." "Bears and wolves in Yellowstone's backcountry don't hold a candle to the danger posed by the people sent there to study them. Yellowstone Standoff balances] potential danger and shady characters." "Graham does a terrific job of maintaining suspense and keeping the reader wondering what could possibly be happening. The remote forests of Yellowstone are well described, and Graham's writing transports the reader..."
"One part mystery, one part mysticism, and one part mayhem--Scott Graham's Yellowstone Standoff is all parts thrilling." "Yellowstone Standoff takes man versus nature--and man tangled up with nature--right to the brink of wild suspense." "What an extraordinary ride You know when a reader says they couldn't put the book down? Yellowstone Standoff is one of those rare books...a tour de force." 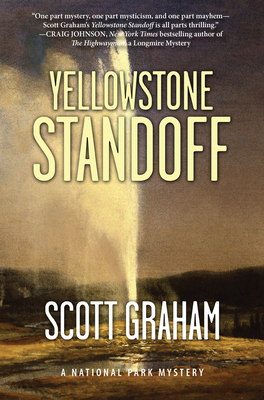 "With sweeping landscapes, engaging characters, and a twisted plot, Scott Graham's Yellowstone Standoff is a must-read mystery that's hard to set down." Book three in the National Park Mystery Series, Yellowstone Standoff takes readers deep into the backcountry of a wildly popular national park. When Yellowstone National Park's grizzly bears and gray wolves suddenly and inexplicably go rogue, archaeologist Chuck Bender teams with his old friend, Yellowstone Chief Ranger Lex Hancock, to defend the suspect members of a group scientific expedition. Soon, Chuck finds himself defending the lives of his family as an unforeseen danger threatens in the storied national park's remote wilderness. SCOTT GRAHAM is the author of seven books, including Canyon Sacrifice and Mountain Rampage--books one and two in the National Park Mystery Series from Torrey House Press--and Extreme Kids, winner of the National Outdoor Book Award. Like most visitors to America's first national park, Graham was awestruck by Yellowstone as a child. His fascination with the park has continued in the years since, with numerous visits to Yellowstone's geyser- and wildlife-filled front country and its incomparable wilderness. Graham is an avid outdoorsman and amateur archaeologist who enjoys mountaineering, skiing, hunting, rock climbing, and whitewater rafting with his wife, who is an emergency physician, and their two sons. He lives in Durango, Colorado. Scott Graham is the author of seven books, including Canyon Sacrifice and Mountain Rampage, books one and two in the National Park Mystery Series from Torrey House Press, and Extreme Kids, winner of the National Outdoor Book Award. Like most visitors to America's first national park, Graham was awestruck by Yellowstone as a child. His fascination with the park has continued in the years since, with numerous visits to Yellowstone's geyser- and wildlife-filled front country and its incomparable wilderness. Graham is an avid outdoorsman and amateur archaeologist who enjoys mountaineering, skiing, hunting, rock climbing, and whitewater rafting with his wife, who is an emergency physician, and their two sons. He lives in Durango, Colorado.